To Cite: Aminian O, Moaven Saidi M, Sadeghniiat Haghighi K, Izadi N. Coverage and Long-Term Immunogenicity of Hepatitis B Vaccine in Healthcare Workers, Arch Clin Infect Dis. 2016 ; 11(4):e35758. doi: 10.5812/archcid.35758. Background: Health-care workers (HCWs) are considered as high-risk groups of acquiring hepatitis B infection due to their occupational exposure. Hepatitis B vaccination is the best protective method. Objectives: The current study aimed to evaluate the coverage and long-term immunity in HCWs and the impact of the occupational health department to improve the performance of a vaccination program. Methods: This retrospective descriptive study was conducted in two academic hospitals of Tehran, Iran, in the occupational health department from October 2012 to September 2013. Results: Of 665 subjects, 620 (93%) received complete series of hepatitis B vaccine; anti-HBs level was adequate in 94.4% of vaccinated HCWs. The rate of non-responders after revaccination was below 1%. Nurses were significantly more likely to have protective anti-HBs levels than other groups (odds ratio = 2.1; 95% CI: 1.05 - 4.19).There was no significant association between demographic characteristics and immunity responses. The time between vaccination and the time of anti-HBs level ranged from 0 to 23 years. It was found that anti-HBs did not decline over the time. Conclusions: The hepatitis B vaccination coverage was more than many studies in other countries. It seems that the vaccination program of the current study had sufficient efficacy for medical surveillance of HCWs in the academic hospitals under study. The essential point for success at a vaccination program was good performance of occupational health department. Hepatitis B viral infection and its complications are a major health problem. According to center for disease control and prevention (CDC) in 2002, 400 healthcare workers were infected by hepatitis B virus (HBV), and approximately 15% - 25% of subjects with chronic infection will die from a hepatitis B-related complication, including cirrhosis or hepatocellular carcinoma (1). Health-care workers who have potential exposure to contaminated blood and body fluids, which occur due to needle stick or other sharp injuries, are at risk of HBV infection more than other blood borne pathogens. The risk of occupational hepatitis B infection is 3 - 5 times more than that of the general population (2). Hepatitis B prevalence in Iran is intermediate (1.5% - 6.5%) (3). The rate of hepatitis B infection among health-care workers (HCWs) is 0.6% - 1.6% per year in Iran (4, 5). Since the hepatitis B vaccination efficiently prevents infection, CDC recommended that all HCWs should be vaccinated against hepatitis B (6). The recommended schedule for hepatitis B immunization is a series of three doses. Post-vaccination testing should be done one or two months after the last dose of vaccine, and adequate immunity is considered when anti-HBs level is at least 10 mIU/mL. Ministry of health and medical education (MOHME) in Iran performs the routine hepatitis B vaccination program free of charge for all health care workers, since there is no standard post vaccination program, the immune response of this group is not evaluated following the primary vaccination and there is insufficient evidence regarding the protective level of anti-HBs, duration of immunity and the need for revaccination. The duration of immune response due to HBV vaccination in healthy subjects is not known clearly (7). Some studies show that factors such as age, gender, smoking and genetic factors can affect immune response. Despite the existence of the infection control programs for health care workers, there is not a comprehensive post vaccination plan to determine the susceptibility of this group in Iran. According to the national accreditation of hospitals in Iran since 2010, each health care worker should undergo pre-employment and periodic medical examination in the occupational health department (8). Before setting up the occupational health department, there were different organizational approaches to monitor the immunity of HCWs in hospitals, such as periodic testing of anti-HBs level after any known or likely exposure even if their adequate immunities were documented in the past. These personal approaches were unscientific and associated with increased overall cost to the country’s health system. There are limited studies on hepatitis B coverage in HCWs in Iran. The current study aimed to assess the HBV vaccination coverage and long term immune responses in vaccinated health-care workers in Tehran, Iran. In addition, the study showed the positive impact of the occupational health department to improve the performance of a vaccination program to protect health-care workers against occupational exposures. The study was conducted in Tehran, Iran. There were 1172 HCWs in the two academic hospitals. Subjects who visited the occupational health department from October 2012 to September 2013 were included in the current cross-sectional study. Health-care workers in direct contact with patients and completed the standard hepatitis B vaccination participated in the study. In the 620 HCWs vaccinated with three doses of HBs-Ag vaccination, anti-HBs level was measured using the enzyme linked immunosorbent assay (ELISA) (Mono bind, USA). Individuals with immunosuppression and hepatitis B infection were excluded. Data collection sheet was used to collect information about gender, age, occupational characteristics, vaccination date, HBV vaccination status, disease history and smoking history. The questionnaires were completed by the occupational nurse of occupational health department. Complete and incomplete vaccination was defined according to the CDC. Positive response or sero-protection was considered as anti-HBs ≥ 10 mIU/mL (9). The study was designed according to the Helsinki declaration and was approved by the ethics committee of the hospital on 2012.7.30. All subjects signed the informed consent letter, and their information was kept confidential in the occupational health department of the hospital. Data were analyzed by SPSS ver. 16 (Chicago, IL, USA). Quantitative and qualitative variables were measured. Chi-square test was used to determine the association between two qualitative variables. P-value < 0.050 was considered as a significant association. Of the 665 HCWs, 620 individuals were vaccinated with three doses. The hepatitis B vaccine coverage was 93%. The study population included 474 (76%) females and 146 (24%) males with the age range of 20 - 71 and the mean age of 34.37 ± 7.98 years old. Demographic and occupational characteristics of the 620 HCWs are listed in Table 1. The duration between the last dose of vaccination and time of anti-HBs level evaluation ranged from two months to 23 years, shown in Table 2. Abbreviations: Anti-HBs, hepatitis B surface antibody; BMI, body mass index. 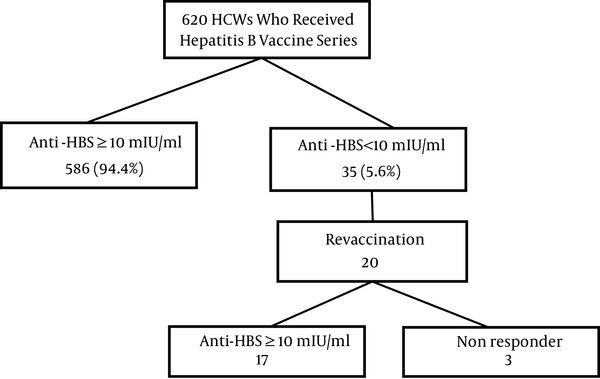 Figure 1 summarizes data on the hepatitis B vaccination and anti-HBs level. HCWs with a standard vaccination schedule consisted of 620 individuals; 568 (94.4%) subjects had sufficient immunity following hepatitis B vaccination. Revaccination was offered for the 35 (5.6%) individuals who did not have protective anti- HBs level following the primary series of vaccination. Twenty HCWs out of thirty-five were vaccinated with the second series. Overall, three of the vaccines were non responder. No significant relationship was observed between age, gender, body mass index (BMI), education, working shift, years in occupation and anti-HBs. There was a significant association between anti-HBs level and job category. Nurses were significantly more likely to have protective anti-HBs level than other groups such as housekeepers, technicians and office workers (odds ratio = 2.1; 95% CI: 1.05 - 4.19). The time between vaccination and the anti-HBs level ranged from 0 to 23 years. The persistence of sufficient immunity 23 years after vaccination was 99%. It was found that anti-HBs did not decline over the time. The occupational safety and health administration (OSHA) recommended hepatitis B vaccine for all health-care workers with potential exposure to infectious blood and body fluids (9). The risk of hepatitis B infection due to occupational exposure depends on the amount of body fluid to which the HCW is exposed, and hepatitis B e-antigen status of the source persons (10). The virus is resistant to ambient temperature and may be infectious on environmental surfaces up to one week (11). The administration of 3-dose vaccine series produces a protective antibody response in more than 90% of individuals (12-14). In Iran, Ministry of health began the comprehensive vaccination program in 1993 and reached to 94% coverage in 2005; at the same time, the vaccination program of health-care workers was added. However, there are policies to vaccinate nursing and medical students, and hepatitis B vaccine is recommended free of charge to at risk HCWs, but it is the individuals responsibility to receive and complete the series. In the current study, hepatitis B vaccine coverage was 93%, suggesting that the results are compatible with those of the healthy people 2010 goal of 90.5% (15). In a national health interview survey in the USA, 74% of HCWs with direct patient contact had full vaccine coverage (16), while a European survey showed HBV vaccination coverage 85% - 93% (17). Accordingly, compared to other countries the current study result is more than those of reported in the UK (18) and Brazil (19). This could be due to implementing the occupational health department of HCWs in hospitals, which aims to protect the personnel from occupational exposure by providing a safe working environment. Hepatitis B vaccine is recommended by the health system in Iran, it is not mandatory, but during the medical surveillance of HCWs in pre-employment and periodic medical examination, HCWs have to provide a document from the vaccination unit about hepatitis B immunity. Another reason for high vaccine coverage is that hospital staffs who work in academic hospitals have more information regarding the infection control unit. The lack of anti-HBs < 10 mIU/mL in revaccinated HCWs with three doses was considered non-responder. According to the current study results, 5.6% of HCWs did not develop a protective level after the first series, and inadequate immunity after the second series of vaccination was less than 1%, which was lower than those of similar studies in Poland (12.2%), Sri Lanka (9.9%) and Italy (11.6%) (20-22). Non responders should be considered susceptible to hepatitis B infection and need to receive hepatitis B immunoglobulin as soon as possible after suspected exposure (23). There is no regulation for medical restrictions and exposure removal and decisions on these circumstances are based on organizational policies. Occupational health department of these hospitals applied medical restrictions and work modification for these non-responders. The sero-conversion rate after revaccination was 85%, which was higher than those of other studies (22, 24, 25). However, the result from a survey in Japan showed the need to receive a booster dose in approximately 10% of subjects after two years (26), it seems that non-responders to the first series have a 30% - 50% chance of responding to the second vaccine series (27). According to the center for disease control and prevention of the United States, immune competent persons that respond to hepatitis B vaccine are protected, even the anti-HBs level is not detectable later; thus periodic monitoring of anti-HBs level is not recommended except for immunocompromised patients (6, 28). There was no association between demographic and occupational characteristics and immune status. The current study did not find any association between age and adequate response; these results were in agreement with those of other studies conducted in Iran, Italy and South Asia (20, 21, 28, 29). Some studies in Japan and Europe found that anti-HBs level decreases with age (26, 30). This finding could be explained that majority of the participants (76%) were younger than 40 years. Findings of the current study were consistent with the result of other studies in which there was no association between gender and immune response (31, 32). Some studies found that females have higher anti-HBs level than males (25). Although these results were not statistically significant, it may be due to individual factors, rather than gender. Smoking and genetic factors are proposed as probable reasons for diminished immune response to hepatitis B vaccination, which were not assessed in the current study (33). The finding that nurses were significantly more vaccinated than other groups (OR = 2.1), is in contrast to some other studies (34). It may be due to the fact that nurses spend more time in contact with patients, or they have better knowledge about hepatitis B vaccine in contrast to other groups (technician, housekeepers). Another reason for this difference could be due to the lack of equal distribution of subjects in different job categories. The duration of vaccine immunity is under investigation. The current study findings showed that immunity does not reduce over time, this result is consistent with those of other studies conducted in Europe and the United States (35, 36). Advisory committee on immunization practice (ACIP) does not recommend periodic testing for anti-HBs even if the anti-HBs declines, the HCWs remains protective (9). To the best of authors’ knowledge, the current study was the first to analyze the immunization status of HCWs against hepatitis B in a period up to 23 years in Iran. Most of the studies estimate the response rate over time from childhood, which proposed immunological memory remains for at least 20 years for the subjects who received hepatitis B vaccine at six-month age (6). There were limited studies which considered time and immune status in HCWs. The hepatitis B vaccination coverage was 93%, which was more than those of many studies in other countries. The current survey found that demographic characteristics had no association with the immunity response, also HCWs had protective anti-HBs level and immunity response does not decline over time. Since the susceptible HCWs are non-responders, the base line testing for immune status of HBV should be done. It seems that the vaccination program in the current study had sufficient efficacy in the medical surveillance and monitoring of HCWs in these academic hospitals. The essential point for success at the vaccination program was good performance of occupational health department. There were several limitations to this study; the participants were limited to two teaching hospitals; it limits generalizability of the results. Smoking and genetic factors could not be evaluated in the study. It would be better to have the baseline titer four to six weeks after the first series and then recheck it over time. Participation bias is likely, since the majority of participants were nurses. The authors wish to thank the management, unions and participants of health-care workers of university hospitals of Tehran, Iran, for their good collaboration. Authors’ Contribution: Omid Aminian, design, revising and final approval of the manuscript; Maryam Moavensaidi, acquisition of data, drafting and final approval of manuscript; Khosro Sadeghniiat Haghighi, design, revising and final approval of the manuscript; Nazanin Izadi, analysis and interpretation of data, revising and final approval of the manuscript.